Cavendish Engineers provide innovative smart tech solutions that deliver energy efficiency and reliability for the built environment. 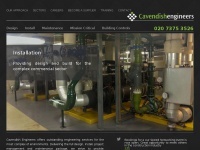 The web server used by Cavendishengineers.net is run by E.I. du Pont de Nemours and Co. and is located in Wilmington, USA. There are many websites run by this web server. The operator uses this server for many hosting clients. In total there are at least 668 websites on this server. The language of these websites is mostly english.